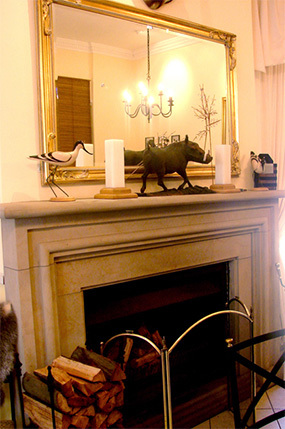 Looking for guest house accommodation in Paarl? We have it all. Just 30 minutes from Cape Town! We treat every guest to traditional South African hospitality while your accommodation is elegant & stylish! Discover the true spirit of the Winelands in the all-embracing scenic splendour of the Paarl area from our doorstep. Wake up to the fresh bouquet of the early morning mountain breeze. In the evening - relax with a glass of South Africa's finest wine, and mull over the day's meander at the crackling fireplace or at our hospitality bar. The memories of our warm, cosy atmosphere, sincere hospitality and personal care will always be etched in your mind and bring you back for more - like so many before. Auberge de Courtrai is your home away from home. Top restaurants, scenic hikes, trout fishing, and many more! Champagne Breakfast on horseback or sunset ride through the vineyards! Hot air ballooning with a spectacular view of our scenic area! Picnic and braai at Paarl Mountain Nature Reserve! Snack Buffet with local wine at the Afrikaans Language Monument! Wine, Brandy, Port or Cheese tasting at surrounding estates! Hiking or horse riding in Paarl Mountain Nature Reserve! Visit a Nut Farm, including a tasting various different varieties of nuts and dried fruit! We will advise you on many other exciting activities, not mentioned here!